When we eat carbohydrates of any kind, we break them down into glucose molecules. This glucose is transported around the body in the bloodstream to the various bodily tissues to be used as energy. This circulating glucose is what is commonly called blood sugar. Our body generally wants to keep our blood sugar (blood glucose) stable and so tries to keep blood glucose levels within quite a narrow range (on average this is about 5.5 mmol/L but can vary among individuals). When our bodies detect a rise in blood glucose, it responds by getting the beta cells of the pancreas to release insulin. The insulin then acts to lower the level of glucose in the blood in two primary ways. First, it helps to move this glucose into muscle and fat cells (via glucose transporters). And second, it slows down the production of any more glucose molecules by the liver. These two actions cause glucose levels in the bloodstream to drop back to normal. Insulin levels influence the creation and storage of carbohydrate, fat and protein in the body. It is involved in allowing these nutrients to be taken into cells and used for many different things. Important things like supplying muscles with an energy source, repairing muscle tissue, and supplying cell membranes with necessary fatty acids are all reliant on the action of insulin. At certain times though, these nutrients may not be needed immediately and so we may end up storing them. For example, if glucose is not required for energy immediately, it can be converted into glycogen and stored in the liver or muscle tissue. 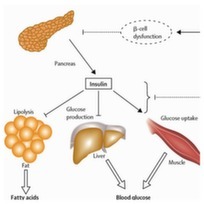 Insulin plays a role here too as it “turns on” the glycogen making process (glycogenesis). This is useful to us as we can breakdown this glycogen back into glucose at a later stage to be used for energy, say during a workout. But insulin can act on both muscle AND fat cells. When insulin acts on fat cells, it allows them to take in glucose in much the same way as it does with muscle cells. Once in the fat cell, glucose can be converted into fatty acids and subsequently stored as body fat. Thus a reason to re-think consuming lots of carbohydrate when our glycogen stores are already full as we may get some of this energy “spillover”. Insulin also does a similar job taking fatty acids that are circulating in the bloodstream and storing them within fat cells (i.e. as body fat). Elevated insulin also prevents the stored fats from being released. Maybe a carb-heavy breakfast isn’t such a good idea for most people trying to lose fat. Who knew. So Does Insulin Make You Fat? No, insulin itself isn’t the devil as it may sometimes seem. It should be clear that it is very important that we produce insulin in certain situations in order to control blood sugar, build and repair muscle, and provide our various cells with nutrition. So where does the issue with insulin and fat gain come in? It’s all in the response. Poor nutrition, a toxic environment and bad lifestyle choices can cause a breakdown in how we respond to insulin. Our cells respond to the presence of insulin because they have something called an insulin receptor on their surface. This is basically how insulin communicates with the cell. 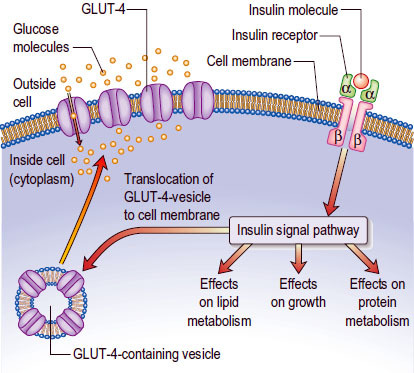 When insulin sticks to the receptor on the cell, this sends a message to the cell to start some process, for example to take glucose into the cell. When things are ‘normal’ and the insulin receptors react with insulin as they should, we are said to be insulin sensitive. We know that insulin is released into our bloodstream in response to a rise in blood glucose. This is nice efficient mechanism that the body has going. Eat some food, break it down into glucose, transport it around the body in the blood and then move it from the blood into muscle and fat cells where we can either use it for energy or store it for use at another time. Keeping this mechanism working as it should is the important thing though. If there is a breakdown in communication between the receptors and insulin itself then we are insulin resistant. I explained the idea of hormone resistance in this video post. The basics are mentioned below. 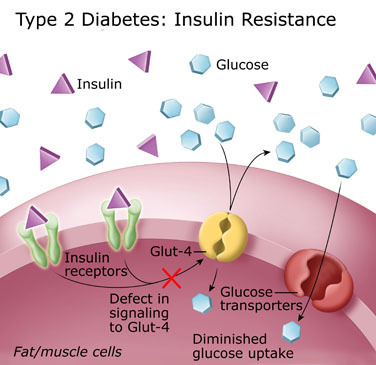 This state of insulin resistance means that the cell won’t recognise the presence of insulin and so the usual actions that insulin triggers are not carried out. Take the example of an insulin resistant person who eats some carbohydrate in a meal. The carbohydrate is broken down into glucose as normal and enters the bloodstream. Insulin is released by the pancreas in response to the elevated blood glucose. However, now the insulin doesn’t trigger the insulin receptors as it should and the process of taking the glucose that is in the blood into the cells does not take place as it should. This causes the blood glucose levels to remain high. 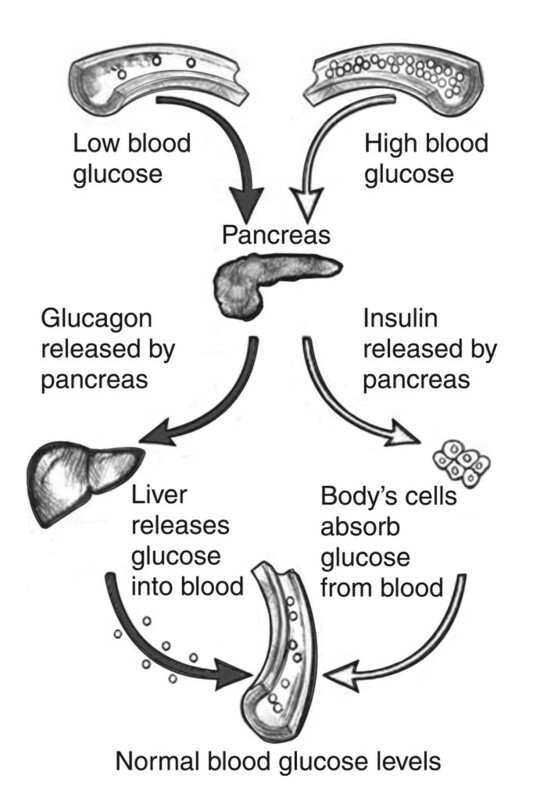 In response to the still high blood glucose levels, the pancreas is told to release more insulin in order to clear it. This vicious circle of events continues leading to glucose and insulin levels in the blood being chronically high. This can then have a part to play in the development of type II diabetes. So what causes a cell to become insulin resistant? There are many potential causes of insulin resistance and still great debate over which are the main players. Obesity, nutrient overload in the mitochondria, excessive refined carbohydrate consumption, fructose consumption, leptin resistance, and inactivity have all been linked with insulin resistance. We’ll leave a discussion of each for another time. Insulin wouldn’t be present in your body if it “made you fat”. Insulin just does what it’s told. WE cause a problem by doing something (e.g. eating excessive amounts of refined carbohydrates and fat) that causes insulin to remain elevated for too long or for cells to become “resistant” to insulin’s effects. Insulin can promote fat gain, but only given the right circumstance; namely, excess energy (calories). If you are metabolically healthy (i.e. no blood sugar disregulation, metabolic syndrome, insulin resistance, etc.) then spikes in insulin should be able to be handled by your body effectively.